Commonly asked questions from home and business owners about their heating, cooling and refrigeration equipment and needs. Planning, installation, maintenance and repair for heating and cooling systems, at home, work or play. Why is it important to regularly service my heating and cooling equipment? How do I know when it's time to replace my equipment? What warranties do you offer and can I purchase an extended warranty? It is recommended that you clean and service your furnace, air conditioner and HRV once a year. Filters that become clogged with dirt will interfere with the operation of your system and affect the quality of air in your home. In addition, it is important to have regular inspections for cracks that are not visible to the eye as these can lead to dangerous gas leaks if left unattended. A yearly service check can help to prevent an expensive repair or replacement in the future. A furnace typically lasts from 15 to 20 years if it is properly maintained. Your air conditioner should serve you for about 15 years. However, you may choose to replace your equipment in order to improve the efficiency of your home and reduce your utility bills. Furnaces and air conditioners have also been modified to reduce noise and improve air quality. The government’s retrofit grants and home renovation tax credits make a change-out much more affordable. Ask us for details! That’s what we’re here for! One of our expert technicians would be happy to guide you through the process of choosing the home HVAC equipment that best suits your needs. You are also welcome to click on our partner links listed below to view product sheets for various equipment that we supply and install. Call us or fill out our quote request form today! Warranties vary by manufacturer. Keeprite furnaces and air conditioners typically come with a 5 year warranty on parts. If you would like additional protection, they also offer a 10 year extended warranty on parts for a fee. 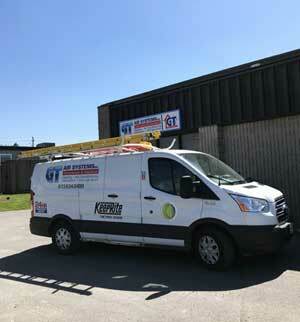 GT Air Home Comfort provides a 30 day warranty on labour for new equipment installs. Since warranties do vary by product, please ask us for details about the specific work you are having done. Get a quote or book your service today! Whether you know what you need or you are just starting to explore options, we are happy to look at your project and answer your questions.